Ever wonder what happens during a "typical" Senior Connections visit? Well the fact is that there is no typical Senior Connections visit, but let us share one story of one visit. 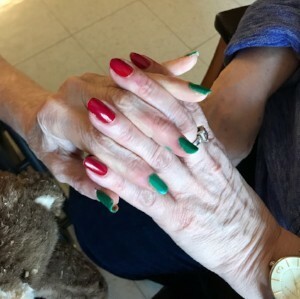 During a recent holiday visit, Ellen Butkus, Senior Connections volunteer, made her visit extra special with a festive manicure with red and green nail polishes, just as her senior friend requested. They had a great time reminiscing about past holidays and listening to some of their favorite Christmas music. We think Ellen did a pretty fantastic manicure job! Senior Connections provides one-on-one meaningful relationships between socially isolated seniors and caring volunteers. The friendship and camaraderie that is formed are always special, but especially so around the holidays. If you are interested in volunteering with Senior Connections or receiving a volunteer visitor please contact Jonathan Tague, Senior Connections Program Manager at 847-869-0682 or email Jonathan at jtague@SASIathome.org.